Reebok Fittest in Cape Town Online Qualifiers - Individual Athletes chance to qualify for the most looked forward to Functional Fitness Competition in South Africa! 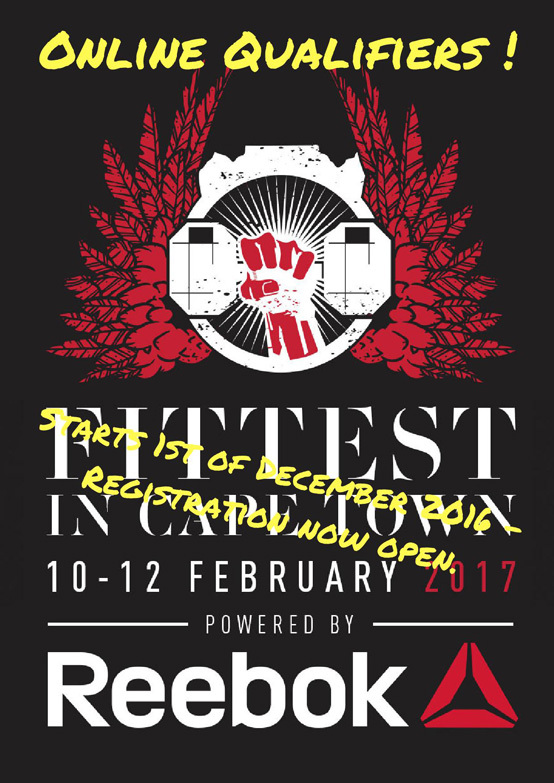 Reebok Fittest in Cape Town 2017 is looking to once more bring the absolutely best athletes the functional fitness scene in South Africa has to offer for a gruelling competition to win the title for not only the Fittest in Cape Town, but also arguably in the country. Last year we had multiple CrossFit Games African Regionals winners, previous winners of FiCT, and pretty much close enough to the entire elite field of athletes in South Africa - now YOU can get a chance to compete with them in the 2017 competition held over 2 and a half days in February! The FiCT Online Qualifier is the last chance to get into the Individual completion if you have not received a Golden Ticket by either invite, or by getting one of the three spots rewarded at our FiCT Jozi Pre Qualifier 2 weeks ago. Qualifier WODs: 3 (released weekly on each Thursday at 12.00). Submission time: From release to the following Monday at 20.00, any later submitted scores will immediately be disqualified. VIDEO REQUIREMENT: Each WOD must be video taped and a link to a Youtube video must be provided before deadline of each WOD***. If you aim to qualify for the Fittest in Cape Town 2017 as an individual athlete you MUST submit your video before the deadline for each weeks submission. If your score is questionable in any way you can be asked to submit a video no matter what your goal is, and if you have no video your will then be given a Disqualified Score (this is to ensure that no athletes submit unreal scores that will mess with the ranking). The Fittest in Cape Town Team reserves the right to request a video following the video standards released for each WOD at any point. You must comply 100% with our required camera angles, failure to do so will result in a DQ score. You must have a judge and a timer in the screen at all times during the video. In the event of a multi scored event the camera must be ROLLING for all parts. A cut video will only give you points until the first cut would happen, or if deemed cheating by the judges team simply a DQ score. 1-5 No Reps, the reps will simply be subtracted from your score. +5 No Reps, your score will automatically be Disqualified. Fittest in Cape Town reserves the right to disqualify ANY video not deemed easy to judge. If anyone walks in the way of your camera during the WOD, if you are out of focus, if you are submitting a video that is not filmed from our required angle - you can count on the submission being Disqualified. Any movement will use standard movement standards that you often see in for instance any stage of the CrossFit Games competition. We are looking for the fittest athletes possible to take part in Reebok FiCT 2017, this means that the Qualifier WOD's may or may not require some heavy lifting and/or high level gymnastic movements. We may or may not provide you with a scaling option for any of the Online Qualifier WOD's, if so any athlete performing the WOD as RX will always be ranked above a scaled submission in the total ranking. This means that if you can not do the RX version of a WOD you can NOT qualify individually for the Fittest in Cape Town*. Reason why we may, or may not, provide a scaling option is that we know that many boxes across the country will be using the FiCT 2017 Online Qualifier to rank their athletes and thus allocate their team spots. We are looking for the fittest athletes in South Africa (or from anywhere in the world) and we hope you agree that by enforcing the above standards we are simply making the competition as fair as it can be. We recommend you to submit your videos early to avoid the old "my internet is slow" as we will NOT take that into consideration at any point. If the video is not uploaded and visible for our judges team by 20.00 on each Monday you will simply receive a DQ score for that weeks WOD. We hope that you will enjoy the Reebok Fittest in Cape Town 2017 Online Qualifier as much as we believe we will. It will provide you with 3 weeks of workouts that we believe will reward the well rounded and highly capable athlete, and at the same time it may provide you with a great chance to compare yourself to other athletes in our part of the world. We are heading into the most important part of the competition season in the Functional Fitness world, why not use our Online Qualifier to start preparing for what's coming in 2017 no matter if you aim to qualify individually or not? Follow the event on the website, http://www.fittestincapetown.co.za or Facebook page: https://www.facebook.com/Fittest-in-Cape-Town-116034931792153. PS. For anyone planning to travel to Cape Town for the event: Please note that the Reebok Fittest in Cape Town 2017 will take place 10-12th of February 2017 with an afternoon event on Friday the 10th for Individuals. Registration will happen earlier that day.